Please refer to our stock # 1274 when inquiring. A shell shaped swirling form by young female artist Takatsu Mio enclosed in the original signed wooden box. It is 6-1/2 inches (16.5cm)wide, roughly 7 inches (18cm) tall and in excellent condition. Takatsu Mio (b. 1976) was raised in Gifu prefecture among the scattered kilns of Mino. She graduated the Osaka University of Arts Sculpture Department in 1999, moving on to advanced studies which she completed in 2001. Her first exhibited works were in 1999, and then again in Tokyo in 2001. 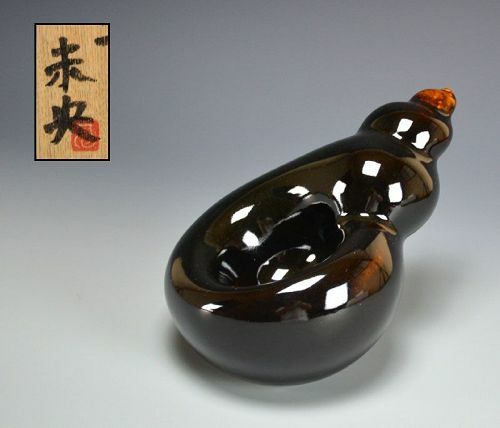 The following year she exhibited with the 6th International Ceramics Exhibition in Mino with several private exhibitions over the following years in some of Japans top venues. In 2005 she made her overseas debut. In 2009 her work was featured in Women Ceramic Artists in the 21st Century (Paramita Museum/Mie Japan) 2011 saw her work accepted into the Faenza International Ceramics Exhibition in Italy, as well as the Nihon Togeiten National Ceramics Exhibition.